You can’t see or even consciously sense it but the air in your home is very likely inundated with dust and a whole range of ugly little microorganisms that can have an impact on respiration and general well-being. Particularly if you have allergies, you may well decide that what your room needs is a concerted shot of air cleaning. Time, then, to have a mosey at our pick of the best air purifiers. After much research and personal testing, I’ve alighted on two main frontrunners: the Philips AC3256 and Dyson Pure Cool Link Desk. Both products come highly rated, with the Philips being the, if you will, purist's choice, and the Dyson being the one option that doesn't look like it belongs in a maternity ward. This time of year we spend a lot longer stuck indoors, watching box sets shielded from the cold and long, dark evenings, so if you're inclined to purify the air that you breathe at home, now is a good time to invest in a purifier – especially as you can snap up a bargain in the Boxing Day and January sales. First up, there is zero evidence that anyone will live longer because they buy an air purifier. However, if you suffer from asthma, hay fever or allergic reactions to particles, or are simply hung up on hygiene to an unhealthy degree, you could benefit from buying one. There are probably 'well-being' as opposed to true 'health' benefits to having an air purifier, comparable to using a water purifier. No, drinking tap water in most western countries is not going to harm you, you big baby, but by using a filter, you can make it taste nicer and be more pleasing to drink. The same is true of an air purifier. According to the US Environmental Protection Agency (EPA), indoor air quality can be two to five times – and occasionally up to 100 times – more polluted than the air outside. Indeed, you only need shine an ultra bright torch indoors with the lights off to see a whole swathe of allergy-inducing crap floating about in the beam: dust, skin particles, animal-related cack, smoke, pollen… aircraft, UFOs, ghosts… all sorts of weird gubbins. An air purifier basically works like a vacuum cleaner, gently sucking in the air around it and trapping the pollutants it captures in a HEPA filter (High Efficiency Particulate Air). Cleaned air is then expelled back into the room. A few purifiers will also electrically charge (ionise) the air molecules during the process and this is said to help further energise the air we breathe. It's like religion. If you believe that and it makes you happy, who are we to tell you not to? The main reason T3 is venturing into this area is that air purifiers now look at least bearable. For many years, they really did look like something you'd only see in a medical context. This excellent model is highly praised by professional reviewers (including Which?) and a huge swathe of very contented users. In the beauty contest stakes, there’s little too choose between this one and the Vax. As in, both look like high-tech bins, swathed in smooth opaque white plastic, with attractive, circular glow lamps that let you know the level of particulates in the air. In this case, blue is good, blue-violet is fair, red-purple is unhealthy and red means LEAVE THE AREA IMMEDIATELY, HUMAN! The Philips’ sensors constantly measure the level of particulates around the appliance, with the relevant number also displayed on the top panel as a PM2.5 reading (PM2.5 refers to microscopic atmospheric particulate matter that have a diameter less than 2.5 micrometers, about 3% the diameter of a human hair). This extra feedback is entirely pointless on a system like this other than to tell you it’s actually doing something. To test it, I pummelled a dusty cushion near the side air intakes and blew some smoke at it and sure enough the PM2.5 number increased substantially while the light turned a concerning shade of violet. The Philips is perfect for medium to large rooms and comes with a range of touch-control functions. When it’s time for bed, select fan speed one and you won’t hear a whisper from it while it goes about its air-cleaning business. It has a timer, too, that moves up in one-hour increments for up to 24 hours. Given its overall efficiency, decent looks and superb feedback, this model is our top purification pick. From Venice in Italy, this looks like a light fitting in a high-class hotel. And it fact Falmec's Bellaria does double as that – clad in glass from the nearby island of Murano, it's a co-production with Venetian designer Marco Zito, and offers very pleasing, soft lighting. But mainly it's a very high-end, high-class air purifier. I don't know about that, but it is easily the best-looking air purifier you can buy. This looks very much like a Dyson fan… and sure enough, it is also a pretty effective and highly attractive fan. The Pure Link Cool Desk scrubs a claimed '99.95% of allergens and pollutants from the air’, with the filter lasting a cumulative 180 days of use. The idea of this one is that it only switches itself on when it detects high levels of pollutants, so in theory, those 180 days should actually last a year. Via its app – the same one used to control the Dyson 360 Eye robot vac – you can set how sensitive to particles you are (if you want your air perfectly clean at all times, expect to see that £50 filter longevity head south to 180 days), set timers, and monitor your room's air quality and temperature, as well as the pollen and pollution counts in your local area. There are people online complaining that the web-connected functions don't work but I don't know what their problem is. Work's fine for me. What's impressive about this is that although it's obviously mainly aimed at keeping the air pure in a bedroom, or sat on your office desk so you're swaddled in squeaky clean oxygen as you work, it does work pretty effectively when the going gets tougher. I bunged mine on a sideboard in the kitchen and it's proved adept even when I griddle a steak, filling the surrounding area with smoke. If you need even more versatility, there the Dyson Pure Hot + Cool Link Desk which, as you'd expect, is like the Cool Link Desk but with the ability to heat. This also works very well. This sensor-festooned Vax is about the size, shape and look of a large Brabantia bin so while it's not would you call gorgeous, it is fairly easy to locate in the corner of a kitchen, hallway or utility room without upsetting aesthetics too much. In auto mode it’s so quiet that the only way you know it’s working is by the large circular light that glows green when the air is good, orange when it’s not so good and red when the sh*t hits the fan. The large HEPA filter comes with a protective plastic covering – don't forget to remove it first or you will spend the next few weeks wondering why the machine doesn’t appear to be working correctly. Not that I did that, or anything. Bear in mind, too, that the outlet faces upwards so don’t expect to be cooled – this is not a fan. Control wise, a cluster of touch-sensitive buttons on the front give access to fan speed, a timer that goes up in one-hour increments, an auto button that when tapped selects the optimum fan speed depending on the quality of the air it senses (full bore is pretty loud) and an ionising button – you know, for ionisation. The remote control also features a sleep button for whisper-quiet night-time operation. Air does genuinely cleaner and fresher after just a few days of use, making this another great air purifier option. This very serious option is over half a metre tall and nearly half a metre wide so consider those dimensions if space is an issue. The Blueair 280i uses the Swedish company’s HEPASilent Technology – a combination of both mechanical and electrostatic filtration, as you probably know – to remove a wide range of airborne pollutants. The unit comes with a standard HEPA particle filter or, for £20 extra, you can opt for the Smokestop filter – if you're a smoker or will be using this in the kitchen. The Blueair's bank of sensors continually measures the volume of particulates floating around before adjusting the suction and filtering levels accordingly, changing the air in a room up to five times an hour. Like the Vax, this machine is also equipped with a several touch-sensitive controls plus two state-of-the-air indicators that provide info on the levels of VOC (Volatile Organic Commands) and particle parts per million. The 280i is also compatible with the Blueair Friend app so you can control it from a distance and see how well it’s working. If you can ignore or hide away its less than luscious appearance, this is about as effective as air purifiers get. If you’re in the market for a very decent tabletop or portable air purifier that takes up very little space and doesn’t look too ugly, consider this titchy 26.5cm model from Airfree. It’s ideal for rooms up to 32m2 and is as silent as a church mouse – not that we’ve ever heard one of those. It also features an adjustable nightlight. In short, it's like a budget version of the Falmec Bellaria, above. The cleverest thing about this model is that it doesn’t require the need for any filters that will require either regular cleaning or periodic replacement. Instead, grubby air is drawn into the intake at the bottom of the unit and the pollutant-filled moisture in it is ‘boiled’ at 200ºC before being cooled and pumped back out into the room all wonderfully sterilised and squeaky clean. Apparently this system will "eliminate up to 99.99% of any microorganisms and allergens in the air." Given the surfeit of positive reviews by asthma and allergy suffers, who are we to disagree? This dinky purifier resembles one of those robots from Star Wars films that only appears for a few seconds, and obviously hasn't been thought through properly. However, being just 18.5cm wide, it's just the right size for a baby’s room or small living areas like studio flats up to around 602m, or, er, narrowboats. Its four-stage hospital-style HEPA antimicrobial filter is capable of removing most airborne particles, including pollen, dust mites and cigarette smoke and it couldn’t be easier to use. 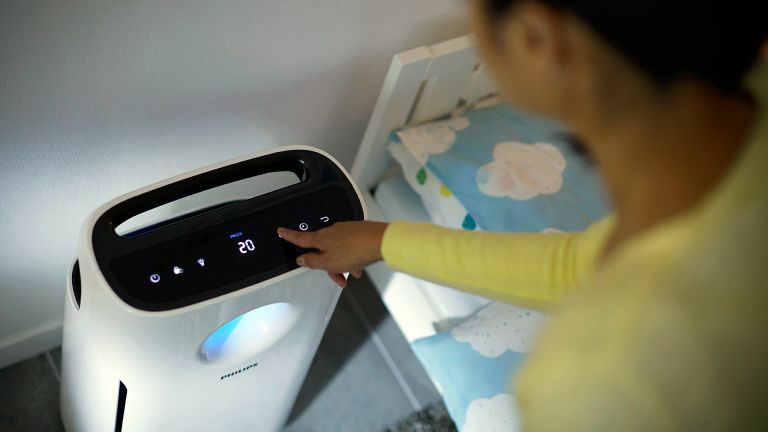 Simply switch on, tap the ‘Auto’ button and, when the sensors detect pollutants in the vicinity, the fan speed increases to draw in more air over the filter. The sensors on this system aren’t as sensitive as the winning Philips – in most cases it’s quite a bit slower to react than either the Philips of Vac when smoke is blown in its direction – but for size and price it performs very well. And, uh, you probably shouldn't be smoking around your baby anyway. This metre-high tower is a much larger version of the other Dyson above, and suited to bigger rooms. The HEPA filter is much bigger but, as the rate of air exchange is also faster, it lasts the same claimed, 180 continuous days or one year's actual use. It's a fine thing, which also works as a fan, although you'd be crazy to buy it primarily as a fan, given the price.